Situated in Pittsburgh, US, Inventionland is such a unique workspace that it’s also considered a tourist destination; with around 15,000 students, teachers and creatives taking tours of the facility each year. Originally built for the purpose of giving product entrepreneurs a place to bring their ideas to life, the 60,000 square foot facility (we can’t really call it an office) houses 16 different “sets”: separate workspaces designed for a different type of invention or a different stage of the creation progress. It’s due to these large, colourful sets that, at first glimpse, Inventionland looks like a children’s theme park. 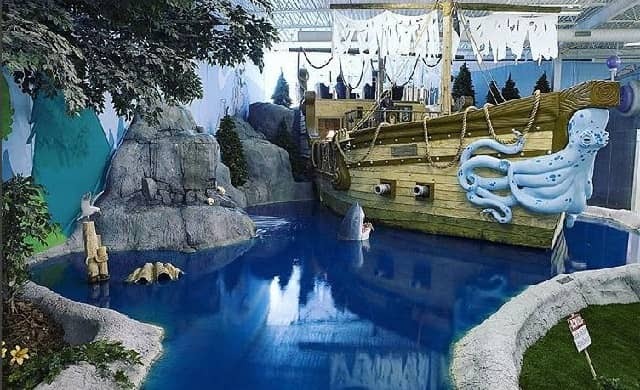 A pirate ship, surrounded by an indoor lake, houses developers of high-tech products and games. Meanwhile, a giant robot welcomes entrepreneurs working in the field of electronics. A log cabin, a castle (complete with drawbridge), a giant shoe, a cave, an elevated treehouse and more each house a different group of workers – or “Creationeers” – and the equipment and tools they’re likely to require for their work. As if that wasn’t enough to differentiate Inventionland from a typical creative studio, these sets are also surrounded by life-like trees, flowers, butterflies and grass, as well as three running waterfalls – which definitely makes a change from the usual bland office corridor. And, not forgetting the more practical needs of its workers, the site also houses a video, audio and animation studio and a decked-out production facility in which products and prototypes can be made. With each set designed for a specific type of work, Inventionland provides focused spaces which are dedicated entirely to boosting productivity, creativity and collaboration among a very particular type of entrepreneur. Firstly, in surrounding themselves with the materials, tools, equipment and programmes that they are most likely to need for their particular type of work, entrepreneurs here can work more quickly and progress smoothly (how many minutes have you wasted roaming around an office shouting “has anyone got any scissors?”). Similarly, decor which is relevant and tailored to the theme of what they’re working on can help entrepreneurs to get into the necessary headspace for focusing on work quickly and, arguably, prompt them to find inspiration more easily. Alongside this, entrepreneurs working in a particular set know they’re working alongside like-minded individuals; after all, everyone is in that set for a reason. Help, advice and support is likely to flow more freely in a space where everyone understands what the other is doing. Furthermore, the playfulness and completely un-office-like nature of each set may well be conducive to a higher level of creativity from the workers within them. We’re not suggesting that you build a pirate ship on your sales floor. But you can take a leaf out of Inventionland’s book by tailoring certain sections of your office to particular teams; encouraging employee performance in ways that that team is likely to respond to. The bare bones of this could simply be ensuring that each team has all of the tools it’ll need to thrive in close proximity. But you could also take it a step further, catering designated zones to each team’s interests and responsibilities to better inspire and motivate them. NB: If you don’t have enough staff to separate into teams, you can still ensure your office design is tailored to your team’s activities as a whole. What artwork and decor would make them feel that the space is truly theirs? Can you paint the tech team’s nearest wall to look like a circuit board? Perhaps the sales team would have fun with a giant phone? How do they like to have meetings and collaborate? Can you provide a stand up space and table if they have a daily stand up, or comfortable seating near the team that likes to have casual catch-up meetings? On a separate note, you might benefit from taking inspiration from Inventionland’s sense of fun and whimsy, and think about how you can make your space a little less corporate. Can you introduce bright colours and unusual decorations? How can you exaggerate what your business does, and its goals, in fun decor? Get creative!